Heat a small skillet over medium-low heat. Add the sandwich, cover, and cook until golden brown and the cheese is melted, 3 to 5 minutes per side. Transfer the sandwich to a plate and pull the bread slices apart. 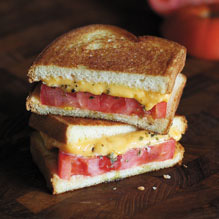 Top the cheesy side of one slice with the tomato and sprinkle with the oregano. Add the other slice of bread, cheesy side down. My mom used to make this for us when we were kids! Best in the middle of summer with tomatoes from the garden!! !